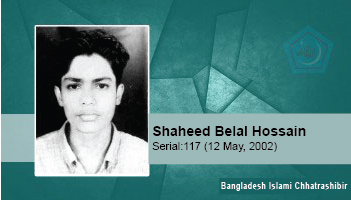 On 12 May, 2002, Belal was attacked by Chhatra League terrorist Shipon when Belal had protested the latter’s harassment of school-going girls and bad behaviour with teachers. Belal was attacked with sharp weapons and hacked and stabbed viciously. He later died from his wounds while being taken to the hospital.